Every mom out there knows that when it comes to successful parenting, organization is a big help. Organization touches all areas of a mom’s life: the kitchen, her workspace, the baby’s room, and, yes, the baby’s stroller. A cluttered stroller basket means extra time looking for a pacifier or the perfect toy to soothe a crying infant. Especially in out in public, it’s important to know where the vital items are to reach them at a moments notice. Thankfully, there are several high-capacity stroller organizers on the market today that allow you to store the things you need for you and your baby in a clean-cut and hassle-free kind of way, and we’re going to show you our top five favorites. 6.1 What is a Stroller Organizer? 6.2 What Features Should I be Looking For? 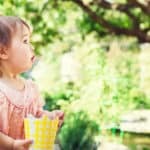 7.0.1 Q: Do I really need to purchase an additional stroller organizer if my stroller has a basket? 7.0.2 Q: How do I know if a stroller organizer is compatible with my stroller? 7.0.3 Q: How can I make the most of my stroller organizer? Deluxe Stroller Organizer | Universal Fit, Two Insulated Cup Holders, Lightweight Design | Lifetime 100% Satisfaction Guarantee! Don’t be fooled by the sleek and chic design of this stroller bag—its functionality meets the same expectations. Doubling as an over-the-shoulder diaper bag, the Deluxe Stroller Organizer by Dwelling Place maximizes your storage space by providing a variety of pockets in various sizes, all for different purposes. With two cup holders, you can carry both your morning coffee and your baby’s bottle. A convenient phone pocket allows you to keep your cell phone on hand without actually being in your hand. Other pockets are great for storing toys, treats, and pacifiers. It even has a larger mesh pocket that hangs down the back of the organizer and is perfect for diapers and wipes. Easy installation includes adjustable straps that you simply place over your stroller’s handlebars. Its universal fit was made to work with just about any stroller, so there’s not worrying if your stroller is compatible. When it comes to stroller and baby accessories, we’ve found that style is a popular trend with moms. Pair style with functionality and you have an excellent accessory. 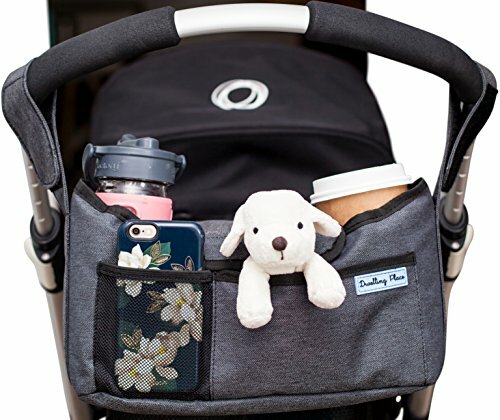 The Ozziko Parents Stroller Organizer Bag is in our top five because it converts from a stroller bag to an over-the-should bag, a backpack, and a handbag. This versatile product was designed for busy parents on the go with the usual needs—a place to put everything they need. The beauty of this organizer is that it is big enough to carry everything you need (diapers, snacks, bottles, toys, etc.) but small enough for convenience. 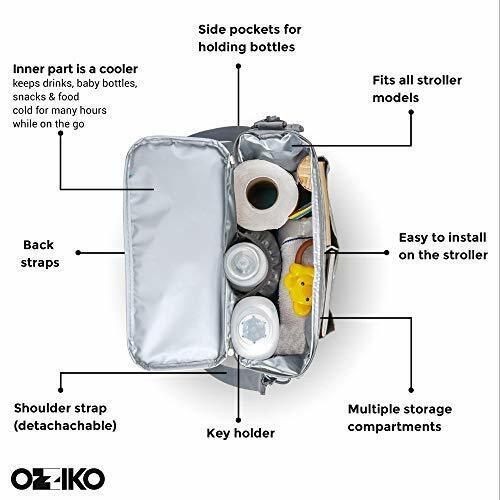 Unlike the standard stroller bags, the Ozziko bag’s main compartment is a cooler, making it perfect for carrying food and drinks. There are two places to carry bottles and drinks along with several other compartments and a special place to carry your keys. Made from thick, durable fabric, this bag was made to be used, not just seen. Its highly functional nature requires it to be strong, and it lives up to that standard. If you’re looking for a sleek, simple, and non-obtrusive stroller bag that holds everything you need, we recommend the Ethan & Emma stroller organizer. Not only does this little organizer keep everything tucked neatly in place, but its classic black design goes with any stroller and gives your ride a clean look. 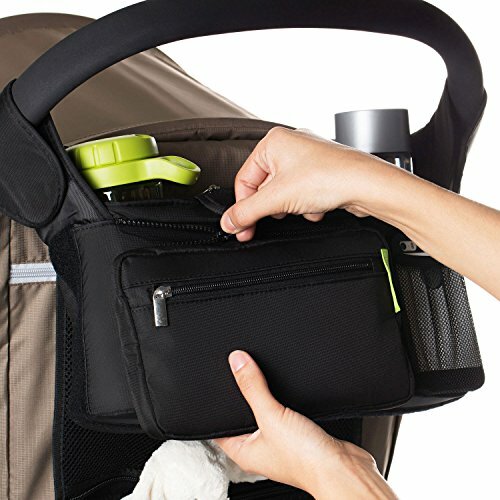 Though this stroller organizer appears to be small, it has all the compartments you need to snugly carry bottles, toys, snacks, pacifiers, and more. The cup holders are deep to prevent spills as well as insulated. Whether you are aiming to keep your morning coffee hot or your baby’s drink cool, these holders do the job. Made with only premium materials, the Ethan & Emma stroller organizer is made to last. Not only will it work on most strollers, but it is made with a collapsible frame that will fold up with your stroller. You don’t have to worry about taking it off and reattaching it every time. 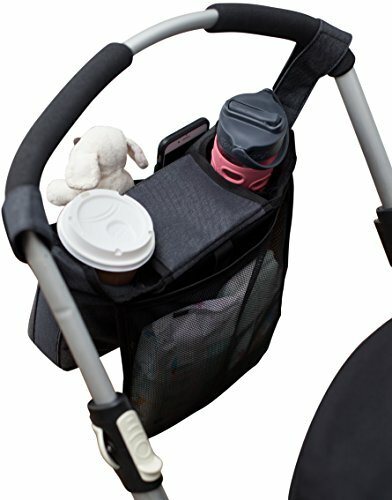 This insulated cup holder and essentials stroller caddy stretches to hold bottles and coffee cups securely, while providing easy access to your most important items. 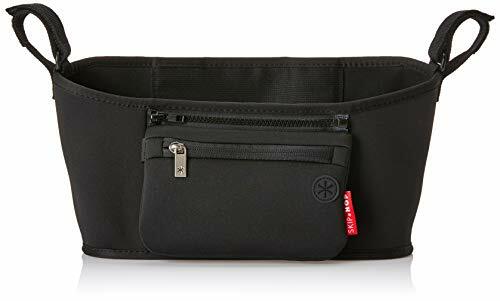 Fitting most stroller bars and handles, this universal stroller organizer bag includes a detachable wristlet for errands and a headphone port for hands-free calls. A universally fitting bag, the Skip Hop Grab & Go stroller organizer is designed to attach easily to any stroller—even umbrella strollers. The small, sleek design is great for trips to the grocery store or a stroll in the park, with enough space to hold the essentials. The main compartment is split into three sections: two insulated drinks holders and a large center compartment for snacks, toys, wipes, etc. The open pocket provides easy access for on-hand items at a moment’s notice, while a zippered pocket is great for storing valuables and keys. On the front, the Grab & Go features a detachable wristlet that is great for running errands. You can use this wristlet to store money, credit cards, and your phone. Additionally, the wristlet has a headphone port, so you can make hands-free calls or listen to music on the go. It’s super easy to attach this bag to any stroller. Unlike some organizers that use complicated Velcro systems, Skip Hop uses two simple clips. Removable wristlet feature is great for holding smaller items like credit cards, money, change, phones, etc. The Stroller Trotter stroller organizer is a multifunctional, universal bag that comes in two sizes: small and large. 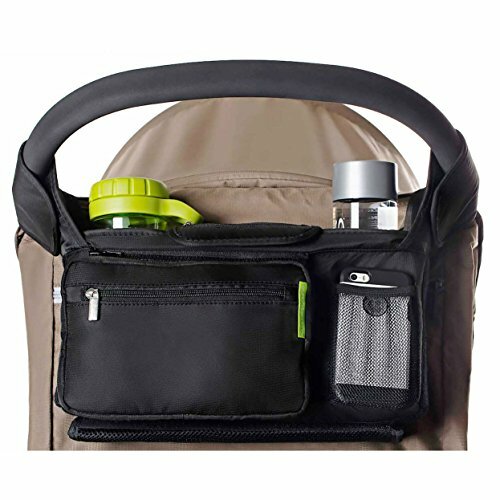 This stylish stroller bag not only features two cup holders, but it has a covered center compartment as well as a smaller front pocket and a cell phone pocket. Made from water-resistant, high-quality fabric, this bag is designed to last through grocery trips, spills, rain, and other life adventures. The attachment straps are adjustable and use buckles, giving you a secure fit that works with any kind of stroller. 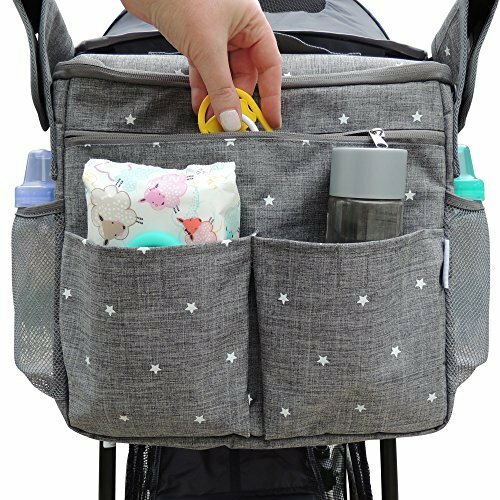 If you’re looking for special functionality, this stroller organizer is a great choice because it can be converted into a carrying diaper bag as well as a bag for the back of your car seat. 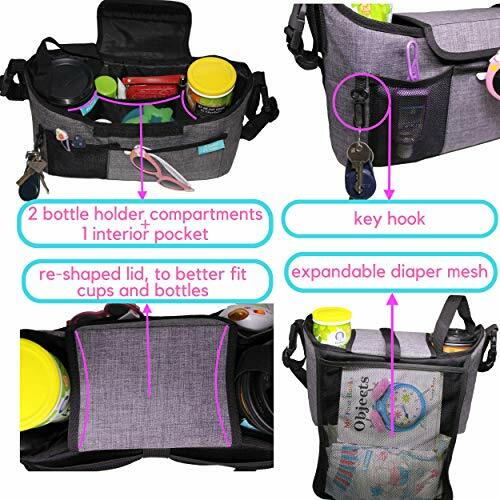 On top of the several compartments we already mentioned, there is also an expandable mesh pocket on the back that is great for larger personal items or diapers and wipes. Smaller details like the key hook and internal pocket stitch this product together to be an excellent choice. No one wants to fall into the trap of buying something that looked good, only to find that come delivery, it wasn’t what you needed. Unfortunately, stroller organizers can become one of those products. It’s important to know what you need before you buy it, so you can avoid the hassle of returns and start using a functional bag. We have laid out some of the most important things to think about when purchasing a stroller organizer. Take a look and nail down your needs before you finalize your decision. What is a Stroller Organizer? The name is fairly self-explanatory, but new moms may not be aware that you can purchase additional storage for your stroller. Stroller organizers are special, smaller baby bags that clip, hook, or Velcro onto the handles of your stroller. They are designed to make your life easier, giving you a convenient spot to put all of your personal items as well as some of your baby’s things. Most strollers themselves come with storage compartments, often underneath your baby’s seat. While this is an excellent feature for a stroller, it’s not the best solution for the things you need on-hand and on a daily basis. Things like your or your baby’s drinks, pacifiers, a cellphone, and wipes are all things that you use often. A stroller organizer keeps these items at hand level, so you can grab them as you need them. Many stroller organizers have different features that set them apart from one another, so you may find that some organizers suit your needs better than others. As we mentioned, there are several different features on any given stroller organizer. Let’s take a look at some of the main ones. Stroller organizers come in various sizes. Some are very small and are great for short walks and runs to the grocery store. Their pockets are made to carry small necessities, rather than a large array of items. If you are looking for a little extra space that won’t add a lot of bulk or weight to your stroller, a smaller bag might be best for you. Larger stroller organizers have many different pockets, some with zippers, Velcro, or open tops, and offer much more room for your various needs. These kinds of bags are great for day-long activities like play dates, trips to an amusement park, or a jam-packed schedule. They are also good for strollers that don’t have much storage space of their own. How organized do you like to be? Some moms love for everything to have its place, so they know where a specific item is at all times. Other moms prefer to throw everything in one spot rather than taking the time to plan everything out. Either way, you prefer it, you can find a stroller organizer for you. Some bags have just one main compartment that is large enough to store everything you need. Other bags have a main compartment as well as several smaller spots that each serve a purpose. For example, while some bags only have one large pocket, others will have specific pockets for your cell phone, your keys, and your drinks. There are typically three kinds of straps used to attach your organizer to your stroller handles. The most common type is the Velcro strap. These straps are usually pretty easy to get on and off, and many of them are adjustable. Some moms get concerned that the Velcro will wear out or not be strong enough, though. There are also buckle straps. The name is self-explanatory: they use buckles instead of Velcro to secure the straps into place. These kinds of straps are always adjustable and are often considered more secure than Velcro. Finally, some stroller organizers use hooks instead of straps. The hooks clip into place on each side and can serve to minimize the need to adjust and are very easy to use. However, these kinds of bags are the least likely of the three to fit a large variety of strollers. The durability of your stroller organizer is important, and your need will vary based on how often you intend to use it. If your idea of a good stroller organizer is a high-capacity bag that you can use every day, we definitely recommend you get a sturdy, reinforced bag made with quality materials. You may be paying a little extra, but it will be worth it not to have to replace it. Other stroller organizers are not reinforced, and that is certainly okay if you don’t plan on using it for tons of items or on a regular basis. Perhaps you have a day trip coming up and just want something you can use now and then. In that case, it may not be worth it to break the bank. When it comes to style, it’s actually fairly easy to find a stroller organizer that’s both attractive and functional. Stylish baby gear is certainly trending right now, so all of those companies are using that to their advantage. There’s likely a style available for everyone’s taste. The chic looks give baby gear a clean, sleek appearance, while the classic, all-black products blend in with everyday strollers and will match any baby accessories you already have. You may think you have to sacrifice the look for functionality, but in this day and age, you can easily achieve both! We have told you all about a few different stroller organizers, but as a mom, it’s natural for you to be curious about the brands we’ve put forth. That’s why we’ve given you just a little bit of information, as well as links, to some of the brands we talked about today. Dwelling Place is a fairly new, low-key brand that’s been around since 2015. They are a lifestyle company that develops and sells products for around the home and children. With a focus on quality, Dwelling Place’s products rarely disappoint. The creators of Ethan & Emma have one mission: to create the best products for parents. Built on the idea that the strollers on the market weren’t good enough to suit his needs, the creator of Ethan & Emma set out to develop the best parent products with an emphasis on detail. Skip Hop is a well-known brand that boasts a passion for re-thinking and re-engineering essentials for parents, babies, and toddlers. With the creation of the Duo Diaper bag back in 2003, Skip Hop has launched its name into the parenting world with a line of fashionable and functional products. Q: Do I really need to purchase an additional stroller organizer if my stroller has a basket? A: The answer to this question really depends on your individual needs as a parent. It’s true that many strollers these days include storage baskets located underneath your child’s seat. These baskets are very convenient for storing not only your baby’s items but your personal items like purses or jackets. However, some parents find that their stroller basket simply isn’t large enough. Stroller organizers give you extra space to store more items. Not only that, but they allow you to keep better track of exactly where everything is, rather than digging through your basket. Many parents also like the convenience of a stroller organizer. While you may still use the storage basket for larger items, it’s nice to have everything you need more frequently right at hand level. It’s much easier to grab the baby bottle that’s right in front of you than to have to stop and reach down and under your child. Q: How do I know if a stroller organizer is compatible with my stroller? A: This is a very common concern for parents. We understand that no parent wants to order a convenience item only to find that it does not, in fact, convenience them, but rather inconveniences them by requiring an order return. The best way to determine if a stroller organizer will suit your stroller is to read up on the product details. Many manufacturers will list what kind of strollers will work with their product. Even after you get this information, it’s important to read through the instruction manual when you set it up. 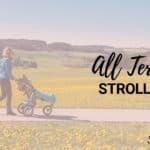 If a product claims it will suit most strollers, it’s like that the claim is true; however, setting up without reading the manual can cause you to believe it won’t work with your stroller. Look for features about adjustable straps. Stroller organizers with adjustable straps should fit most strollers. Another good way to see if an organizer is compatible with your stroller is to read up on the product reviews and get first-hand experiences from other buyers. 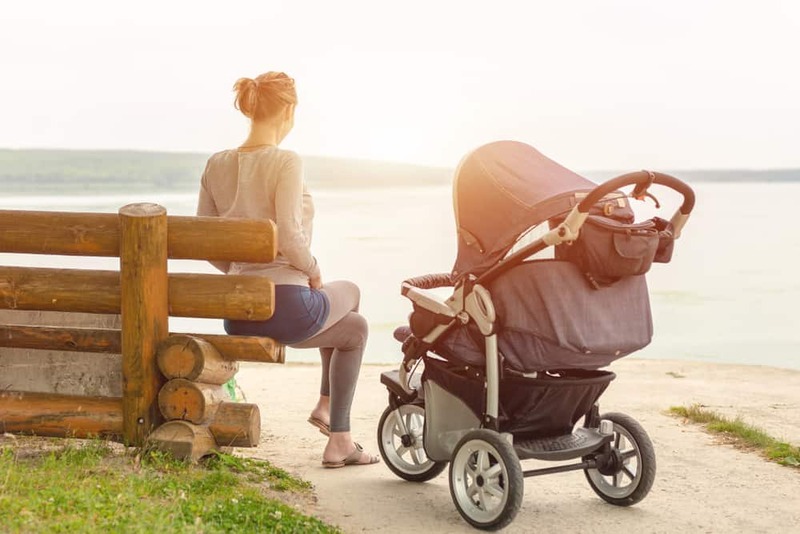 If it’s a popular product with a lot of reviews, you may be able to find someone who has your stroller and will tell you if it worked for them. Q: How can I make the most of my stroller organizer? A: The best thing you can do to get the best use of your stroller organizer is to read the manual. Organizers with several pockets often have specific or recommended uses for each pocket. A manual can likely lay these out for you in a diagram. You can also look through user reviews to see how others used their space. Many moms will upload pictures into their reviews, so you can see exactly what they put in their organizer and where. Many pockets and pouches on stroller organizers are not specified as designated for any one item. 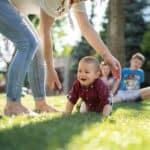 For that reason, many moms develop their own systems that work best for them. We recommend putting items you use most or need the most often towards the front or the top. 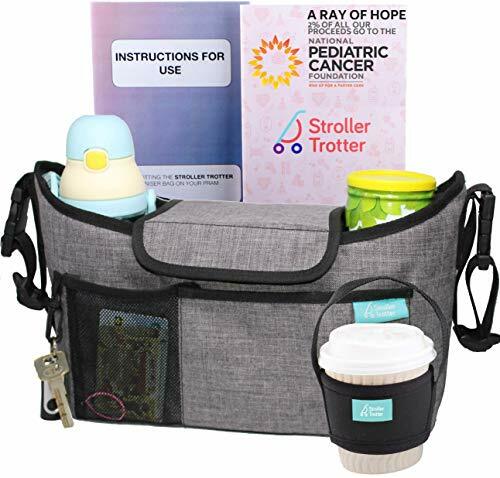 Keeping all of the important features in mind, we have chosen the Ozziko Parents Stroller Organizer Bag as our number one product from this list. At a good price, you receive not just a stroller organizer, but a backpack, a handbag, and an over-the-shoulder bag. Basically, you’re paying for four products in one! With a stylish design intact, you get a fully functional stroller bag with several convenient compartments along with a large main compartment that doubles as a cooler. Its large size makes it great for long day trips, yet it’s still small enough to carry along all day. You can purchase the Ozziko Parents Stroller Organizer Bag here!